Richard was born on September 8, 1157 AD, at Beaumont Palace in Oxford, England. He was the third legitimate son of Henry II and Eleanor of Aquitaine, and was not expected to ascend to the throne. Henry II and Eleanor had four sons. Their oldest son, who was the legitimate heir to the throne, was called Young Henry. Henry was a notorious highwayman who was known to rob monasteries. He died in 1183 while living in poverty. Henry's second son married the heiress to Brittany. Soon after the marriage he died under unknown circumstances. Then in 1189, Richard the Lion-hearted (Richard Yea-and Nay) became king. Richard never kept it a secret that he disliked England. He would only visit there twice in his life. Once for his coronation, and a second time when he needed money. In the ten years he reigned he spent less than one year in England. 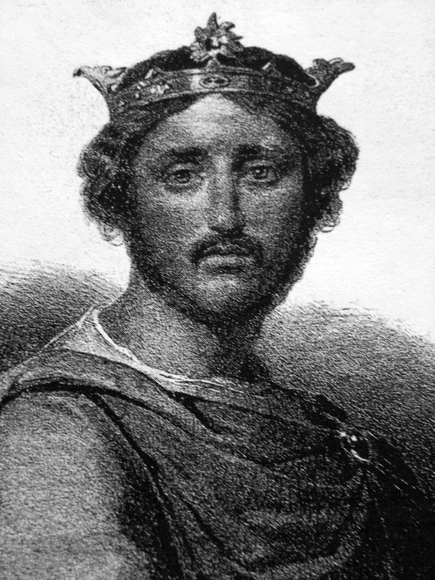 During his reign, King Richard drained the government's coffers as he moved from one battle to the next. He was quoted as having said that he would sell London if he could find a buyer. Richard was a huge man for his time, standing at 6' 5”. Surely, he towered over everyone else. Historians know little of his early education other than he liked to write poems as a young man. We also know that from an early age he showed great promise on the battlefield. Soon after his coronation Richard began preparing for the Third Crusade. His first action was to raise taxes so he could finance the expedition. Richard was an excellent leader and there was nothing he liked more than a good battle. In Sicily, Richard and his army joined forces with King Philip Augustus of France. Then a short time later, while on their way to the Holy Land, Richard conquered Cyprus which was very wealthy. Richard used the money to continue his crusade into the Holy Lands. However, things did not go smoothly. On his way to Palestine he got into quarrels with Emperor Henry VI, and the ruler of the Byzantine Empire. Then on June 8, 1191, Richard and his forces successfully joined the French and the Germans in the siege of Acre. However, once again Richard had a difficult time getting along with the leaders. Things got so bad that they started to attack each other. Then, not long afterward, Richard was stopped by the great sultan Saladin when he attempted to capture Jerusalem and the Holy Lands. Richard and his army did not give up easily. They would try three more times to capture the Holy Lands before finally signing a treaty with Saladin. After the Third Crusade failed Richard found that all paths back to England led through lands that where controlled by people who were now his enemies. Heavily disguised, Richard attempted to slip into Austria where King Leopold was looking for him. Just a short time passed before he was recognized and captured. Richard was quickly turned over to his enemy the Holy Roman Emperor Henry VI. Henry knew what he wanted, an enormous ransom. He demanded 150,000 marks which was an amazing amount of money. Once again the English government raised their taxes to pay the vast sum, but the English people never could raise the entire amount. Eventually, Richard was released anyway. Lots of good things happened in England during his absence. The English government emerged stronger than ever before, and the judicial system was greatly improved. Also, Richard had needed money so often that they now had a system of direct taxation which had never been tried before. Richard would die in 1194 from a crossbow wound that occurred during a battle against King Philip Augustus of France.